Westlake’s trendy dining scene got a boost of rustic elegance on Nov. 2 as Burntwood Tavern opened its doors in the former Champp’s location in Crocker Park. 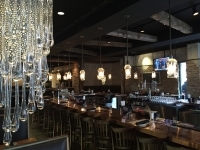 The 8,000-square-foot, 250-seat space has been revamped with a blend of rustic woods, elegant hand-blown glass lighting fixtures, and a modern copper-topped bar. “This space is an ideal location for serving our straight-forward, classic dishes as well as our signature cocktails. We’re excited to bring our total dining experience to our guests in Crocker Park,” said Bret Adams, founder and CEO of Burntwood’s ownership company, Chef Art Pour Restaurant Group. The tavern is known for its cocktails made with house-infused vodkas in diverse flavors such as cucumber, pickle and bacon. A wide selection of craft beers is available on draft and in bottles, including seasonal favorites from Great Lakes Brewing Company and Fat Head’s Brewery. This location marks the seventh Burntwood Tavern in the Greater Cleveland area and the second in the Westshore area, along with the Rocky River location. “We invest in our communities as well as our guests from a social, business and philanthropic standpoint, and Westlake will be no different,” Adams said. The restaurant is open 11 a.m.-10 p.m. Sundays through Thursdays, 11 a.m.-11 p.m. Fridays and Saturdays. Weekend brunch and daily happy hours are offered. It is located at 12 Main Street in Crocker Park, next to the movie theater.